The following post will deal with the first thing a Bitcoin trader needs (after learning about Bitcoin), which is a Bitcoin wallet! Just like you have a physical wallet for your cash, the Bitcoin wallet is where you would store your bitcoins. There are many kinds of wallets, some are physical, some are digital. This guide will help you choose the best Bitcoin wallet for your needs. In order to access your Bitcoin Wallet what you need is a special password or a private key, which is a very long combination of letters and numbers. Once inside your Bitcoin Wallet, you may monitor your balance and use your bitcoins. You can also receive bitcoins by providing the payer with your Bitcoin Address, which is an address derived from your private key. The private key itself should be kept as a secret since those who have it can control the bitcoins that are “stored” in the wallet. Now, we can divide all Bitcoin Wallets to two main types: Hot Bitcoin Wallets and Cold Storage Bitcoin Wallets. Hot Bitcoin Wallets is the most popular way of storing bitcoins. They are wallets which are located on the Internet. There are Bitcoin Exchanges and Services which will provide you with a free wallet if you sign up with them. This is the most popular way to hold bitcoins for a couple of main reasons. First, most people don’t just keep their bitcoins in their wallets. If you need to buy and sell bitcoins, you need an exchange. Many Bitcoin Exchanges provide their users with a Wallet. Second, when you are working with an online service, you don’t have to worry about your private key. You can simply login to your Online Bitcoin Wallet with your chosen user name and password from anywhere, anytime. The downside of Hot Bitcoin Wallets is that they are more vulnerable to hackers. Therefore, you want to make sure to only open a Bitcoin Wallet with a trustworthy Bitcoin exchange. Your chosen provider should be honest and offer the best security available. You should also opt for multi-factor authentication options wherever possible (e.g. authenticate your login attempt by entering a code received by SMS). Personally, we find the convenience of being able to use your bitcoins from anywhere and anytime worth the slightly added risk, which is really minimal if working with legitimate service provider. For those of you who prefer the most secure form of Bitcoin Wallet, there is the Cold Storage Bitcoin Wallet. 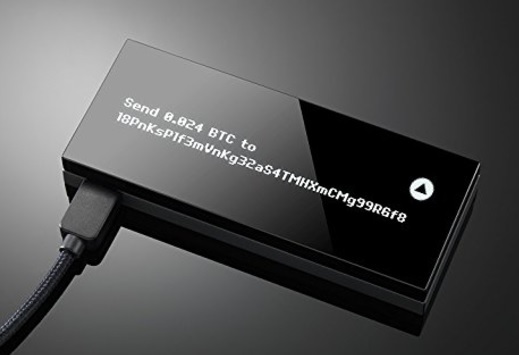 Examples include a simple piece of paper with your key written on it and a hardware wallet. This type of Wallet is offline and therefore cannot be hacked. While being highly secure, the main downside of this type of Bitcoin Wallet would be that eventually you may want to use your bitcoins whether it’s in order to buy a product or a service online or to use an exchange to sell your bitcoins in the case that you’re a Bitcoin trader. In order to do that, you will have to use an Internet connection and in the process, you will again encounter the risk of getting hacked. Obviously, you will have to carry your Cold Storage Bitcoin Wallet wherever you go in order to use it. Well, the ideal way to keep Bitcoin depends on what kind of Bitcoin user you are. If you are a trader who needs to constantly buy and sell, then having an exchange connected Bitcoin wallet would be beneficial. If you use bitcoins in day to day life to make purchases, then having an online Bitcoin wallet could come in handy and save you the trouble of carrying a hardware wallet with you. If, on the other hand, you bought a large number of bitcoins for a long-term investment, it might be worthwhile to keep them offline. You can also combine both methods and store most of your bitcoins on hardware and a few for day to day expenses online. BitPay Review – Still Building the Future? Ledger Nano S Review – Best Bitcoin Wallet for Investors? What is your favorite wallet? Feel free to comment below. Hey everybody,attention.If you are using online wallets in blockchain.com ,take care of your cryptos. My bitcoin kept in blockchain.com was stolen about one month ago.As I got nothing like a mail in my e-mail box,I thought maybe troy viruses stole my password,but found nothing after checking viruses. I googled and saw many cases like mine ,that cryptos stolen secretly.Someone told me that hackers could stole cryptos easily if they have your address and password.Cause cases like this happened not only once,it is not recommanded to keep your cryptos in blockchain.com’s wallet. In order to avoid a result like my case,I advise you that choosing another safe wallet rather than blockchain.com. late I saw your warning. I was also put on a blockhain banknote. My amount is now NULL. my name is mr.Ally Adam from Tanzania……..can i have a way to join as a member? PaulM here from Ontario, Canada. I have a request if I may. Could you please re-visit USI Tech and provide any insights moving forward. Too many people are falling into this program. Later adopters are going to lose. There are two more coming out of Toronto, Canada. You have a great site here and I am proud to be a subscriber. I also subscribe to 99bitcoins and a couple of others. I am currently looking into Dascoin that will be released in March, 2018. So far what I see is that it is not a Ponzi. Your thoughts are always valued. wich would be the best ripple wallet?after i last some ripple to wallet ripple i need some honest advise.thanks,and keep up the good work. We recommend the Ledger Nano S for storing Ripple. Thanks, just purchased one for that exact reason. I hope not, because Neteller is not a scam… If anyone can clarify this question, it will be highly appreciated. Which site are you referring to? Please include a website address you’d like us to investigate. Neteller is not a scam. You can’t use bitcoin deposit to spend money with the mastercard. It’s clearly stated. You can withdraw it to your bank account or transfer it to another Neteller account or merchants. Neteller is accepted by all poker sites, casinos and betting sites. The mastercard is free. I’m using it for years and I’m fully satisfied. They are authorized by the FCA and they own Skrill and Paysafecard as well.